The statistic was revealed at the 15th Perinatal Mortality/Morbidity Conference, held at the Methodist Church Hall on Friday, February 11. 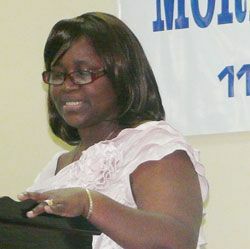 Sister Faustina Ballantyne, Departmental Head for the Maternal and Child Health Department at the Milton Cato Memorial Hospital (MCMH), said of the 1,725 births in 2010, the number of teenage births was 345. The number in 2009 stood at 430, which marked an increase over the figure for 2008, which then stood at 366. Ballantyne further explained that the majority of the teenage mothers were between the ages of 17 and 19.
âAs in previous years, the trend continues; these are the ones who disrupt their studies to start a family,â Ballantyne explained. âSome of them are able to continue and become professionals, but only if they have the support to move on,â she continued. However, a startling statistic was revealed, in that there were 11 births recorded among adolescents, age 10 to 14. Ballantyne did not reveal the general age range of the fathers, but later told SEARCHLIGHT that as a medical practitioner, there was very little legal action that could be taken. According to the medical official, such cases are usually referred to the Social Welfare Department and with regard to any legal action being taken, it was left to the parent to do so. Earlier this year, Dr. Douglas Slater, the former Minister of Health, who now holds the portfolio of Minister of Foreign Affairs, said that he would be doing all in his power to educate the general public on the issue of paedophilia. He suggested that the problem was one of the reasons why the United Statesâ State Department had placed the country on the Tier 2 watchlist for countries that were deemed unsatisfactorily compliant with its (US State Department) human trafficking act. âWhat I have tried to do, what I am doing now and will continue to do, in the interest of the human rights of the young people of this country, especially our under aged girls, [is] to raise the issue of paedophilia,â Slater said during the budgetary debates last month.